It is quite difficult to come up with and implement an original and effective fundraising action. The fundraiser should be quick, easy and fun to set up. To help you with this, we have put together the 10 best ideas and tips for you. The ideas come from already successfully completed fundraising campaigns on the Whydonate platform. These fundraisers are therefore set up by ordinary people like you! Less is more! Do not just bake anything, but focus on 1 specific product and promote it in a prominent way. So you will not be easily overlooked. Make sure you walk up! Try to stay around your stand at a big event, such as a music festival, sports competition or a food festival. Do not assume that this is sufficient, as you will have to promote your product on the spot by means of samples, flyers and social media campaigns. Make sure there are always people at your booth because this attracts new people more easily. Selling your old stuff on a flea, junk or trunk market is a successful way to raise money. Believe us: by giving a new twist to this fundraiser, you can earn a lot of money! Know your audience. View the stuff you plan to sell in detail and decide who your ideal target group is. Do you sell classic crockery and 60s dresses? Then focus on the somewhat older conservative audience. Get help from your friends. Once you have defined a theme and place for the items you want to sell, you can ask your friends if they want to donate certain things they have. Bringing together several households can lead to a great combination, which will attract more buyers. The sales day. On the day of sales, your stand should look well-organized, attractive and cozy. If possible, make sure you have music, chairs and free drinks for your visitors. There is nothing more unattractive than a big pile with clothing whose appearance you have no idea of. Hang as much as possible and label everything well. Fundraising idea 3: Go crazy! Fundraising does not have to be too serious. Humor is a great way to connect with people and collect donations for a good cause. Use humor in your fundraising campaign and you will achieve greater success! Rewards. Give your donators an unusual (funny) reward for their donation. For example, the person who donates the highest amount determines in what outfit you will run the marathon. Set funny mini goals. Just like it is done with the rewards, you can also do something playful with certain mini goals. For example, if you reach half of your goal, you shave your head. If you get the full amount, you could think of something funnier. Organize a ‘something’ marathon. Are not you a marathon rider yourself? No problem! Organize a marathon with a different physical activity that you feel comfortable with. Physical challenges are a great way to prepare people to make a donation to your goal and fundraising campaign. Choose your main strength. What are you good at? Playing chess? Organize a 24-hour chess marathon, where each opponent has to make a donation to you when you win from them. Be creative. Do you have a crazy talent, as long as you can keep your breath under water? Let your sponsors pay a €1, – fee per 10 seconds that you can hold your breath under water. Are you going to have a birthday or do you give a different kind of party? Do not ask for a gift, but indicate that you are raising money for a good cause. You can do this on the spot, by putting a collection box (or just a box). But you can also make a money collection online on Whydonate. so you can send people to your personal page in advance and ask for a donation. That saves a lot of hassle with cash and is a lot more transparent. You can add a piece of text or video to the page to make an original donation. You’ve probably played it, Bingo! A very popular game that is played both online and in venues. The player has a nice evening with snacks and drinks and with some luck goes home with some money. However, the organizer can earn a lot of money with this! Bingo book. Upon entering, the guest can buy a Bingo book that they can use all night. If the guests want to increase their chances of winning by two or three, they can also play with a double or triple book. Per booklet, you can ask between €25, – and €50, – (depending on the prices). If several booklets are purchased per visitor, a discount can of course be given on the second and third booklet. Snacks and drinks. Make sure you have tasty snacks and drinks during the evening. Promote this clearly in all advertisements, this attracts more visitors. Lottery. Does a Bingo night last too long? You can also just sell lots of tickets, after which you decide the winners with a 15-minute draw. Such an action works perfectly at a sporting event where people want to watch a game. Sell ​​the tickets before and during the match and do the drawing below. Do you have some stuff in the attic? Then look for companies in the neighborhood that want to offer stuff or services for free. You can then sell them through an auction. This way you have minimal costs and a maximum yield. This is perhaps the most time-consuming fundraiser, but can also certainly yield the greatest amount of money if executed properly. Organize an evening full benefit dinner where you sell entire tables or single chairs. Do not start too big, because with a half empty room the evening will not be successful. Food and drinks. Provide an extensive dinner with a minimum of 4 courses and, in particular, sufficient drinks. There are plenty of options during the evening to let the guests pull their wallets. Entertainment. To sell all tables and chairs as quickly as possible, you need to get a good act. 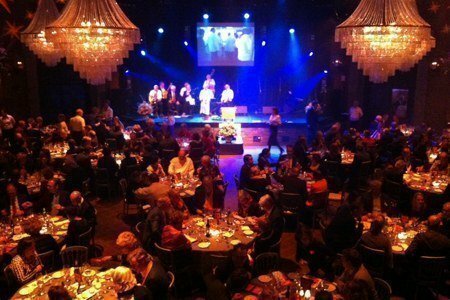 Provide at least one influential person who wants to perform during your charity dinner. Communicate this in advance, so that people will come attend. Since all proceeds go to charity, you can ask the artist for a hefty discount. Auction. During the evening itself, a lot of money can also be raised. This way you can organize an auction where people can bid on objects and services sponsored by companies. Are you a member of a sports club and do you play a sport where you can score? Then organize a points action! You can agree on an amount per goal per sponsor in advance that you will receive at the end of the competition or season. The amount is determined on the basis of the number of goals scored on average per match. You can also agree on a maximum amount. View a good example of such an action here. Yes, internet is a great way to reach people, but we must not forget how important personal contact is. Research shows that fundraisers who organize offline events are 43% more likely to collect more than €5,000. Social Media. The fastest and easiest way to reach your network is through social media. Think of Facebook, Twitter, Google+, LinkedIn, Whatsapp and Email. These are all perfect channels to announce your fundraiser campaign. Tips: ensure good content, repeat your message a number of times and make it as personal as possible. ‘Off-line’ event: Besides all digital channels, it is also smart to also organize an offline event where you can make personal contact with the visitor. Do you want to raise funds successfully during this event? Then the most important thing is that you dare to ask people for a gift!